The Freecom ToughDrive Sport comes with a picture of a mountain on the packaging, which tells you all you need to know about this drive – it's tough and ready for extremes. Symbolism aside, this is a unique looking external hard drive with a look that is sure to divide opinion. 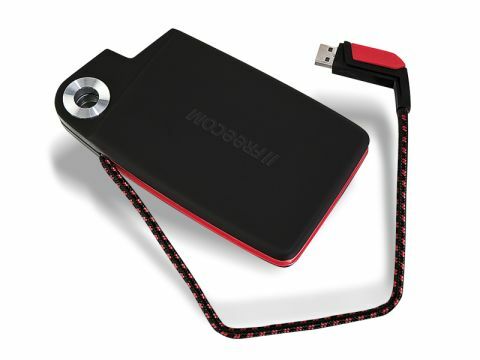 The tough black plastic shell is available in a number of capacities – in this case 500 Gigabytes (GB). The supplied USB cable is permanently attached and wraps snugly around the rim of the casing. The cable has a nylon fibre coating that is intended to represent a climber's rope. Continuing the climbing theme, the drive even has a large metal ring that a climber's rope can be fed through, presumably so you can attach it to your rucksack, completing the rugged image of the drive. Freecom doesn't make its own hard drives, so the company has fitted Samsung's HM251J drive inside. This disk spins at 5400rpm and is primarily designed for laptops, so you'll find the standard 8MB buffer and SATA connection in place. When it came to matching image with reality, we found the drive to be tougher than all but the LaCie Rugged. However, with only an attached USB port for connection, you'll find connectivity options are limited. It also means data transfer speeds are severely restricted. In fact, the drive proved to be one of the slowest around, making it less than ideal for copying large quantities of data on the go. Extra features include pre-installed password protection, which works well for both Windows and Mac laptops. We also found it switched easily between Mac and Windows devices, giving it a degree of versatility. The ToughDrive Sport certainly gains points for style and originality, but unless you genuinely have a need to take your laptop and external drive into extreme environments, you'll likely find the novelty of this drive will soon wear off.